Holy Fire is, in fact, featured into the “Off Program” of Art Brussels, the international contemporary art fair (April 18 - 21, 2008). Taking its cue from this occasion, the exhibition wants to show that new media art is just art of this century, wants to reduce the gap between digital art and contemporary art, and to participate in a broader understanding and acceptance of digital media and cultures. 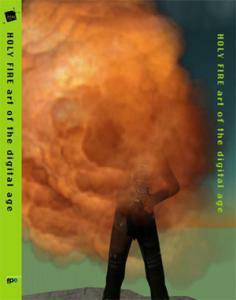 The artworks in Holy Fire are not new media art, but simply art of our time: art which appropriates institutional or corporate identities, creates fictional ones, hacks softwares and game engines for its own purposes, infiltrates online or offline communities in order to portray them or their own myths, subverts existing tools or creates its own ones, explores the aesthetics of computation and information spaces; or, more simply, uses computer hardware and software in order to create art which talks about our world. Holy Fire is probably the first exhibition to show only collectible new media artworks already on the art market, in the form of traditional media (prints, videos, sculptures) or customized new media objects. Holy Fire presents contemporary artworks made with comtemporary technologies and designed to be collectible. The art market offers new sources of income for new media artists. Up to now, these have been limited - when they exist - to public funding from institutions and governments, sometimes dictated by politics. An art market can help develop a new economy through direct relations between artists and art consumers, confirming the artists’ social role and the support of the people who are increasingly looking for something different from mass-produced digital gadgets. Holy Fire, the title of the exhibition is a reference to a well-known book by Bruce Sterling, a book which, among other issues, envision the art of the (at that time, future) digital age. In the same time, the issue makes reference to the passion that helps a growing number of people (artists, curators, gallery owners and collectors) to take care of an art that is temporary and variable by definition.